Marco Canvas represents 4 generations of sewing tradition since the 1920’s, but current owner Ed Srzynski is not looking to rest on the coat tails of his forefathers. His Six Sigma training and eye to the future keep the company continually improving. A familiar saying of Ed’s around the shop is, “The only thing everyone here knows is constant is that things are going to be changing”. Last week Carlson Design was excited to be apart of Marco Canvas’s latest change and step toward continual improvement when we installed and trained the entire Marco Canvas shop on our digitizing, plotting, and cutting system. 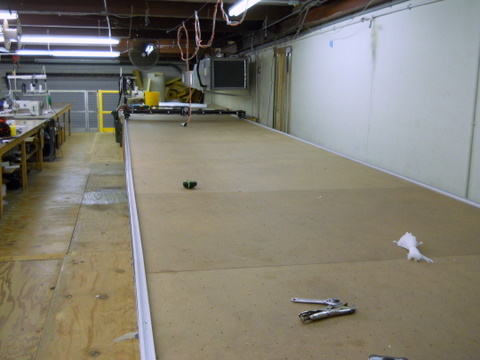 To start — after increasing the foot print of their 2nd story mezzanine, they cleared out their old cutting table to make room for our steel frame vacuum table. We help many customers build or convert their existing tables, but based on their schedule purchasing our table was an obvious choice. 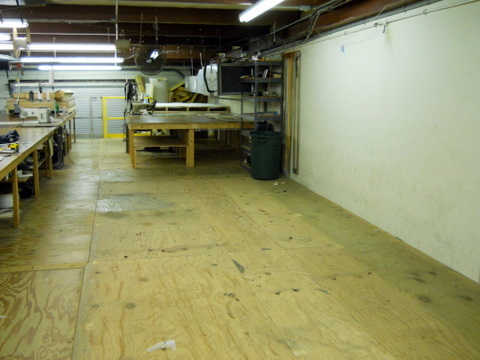 Marco cleared a space for our 6'x28' vacuum table. You only need access to 2 sides, but it's nice if you can walk all-the-way around. Assembly is easy with 2 people. The entire table uses the 1/2" nuts and bolts. Finger tighten. 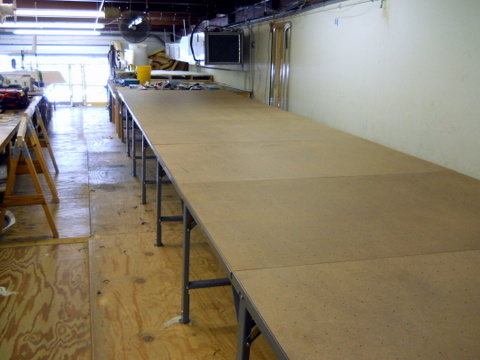 Available in endless 4' sections, you can always make your table longer. 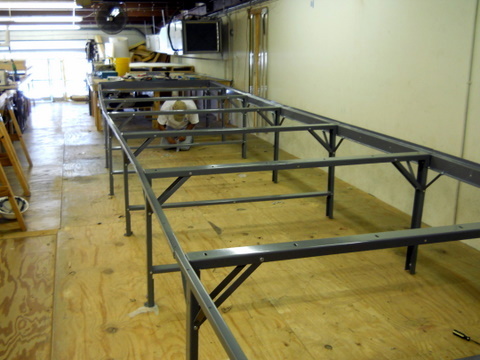 Like an 'Erector Set' for adults, assembly goes quickly. Now is a good time move your table exactly where you want it. 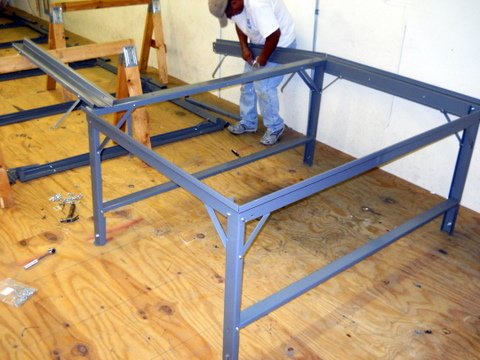 Set composite table tops on the steel frame. Place steel connecting tabs between each top. 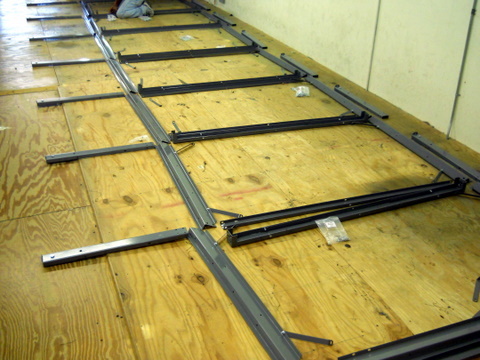 Once all the tops are in, you are ready to square the frame and tighten all nuts. 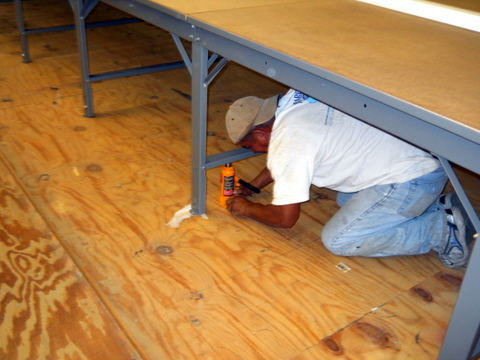 Using a bottle jack or car jack, find the table's high point and level both sides. This is an important step. 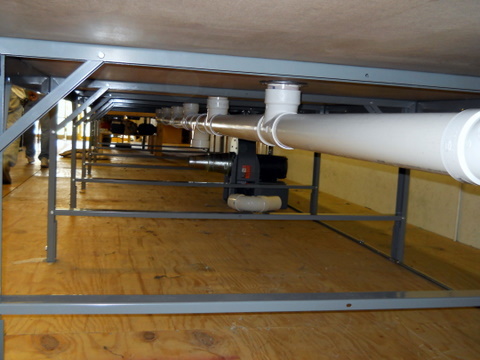 Silicone pipe flanges and attach pre-cut PVC plumbing to the bottom of your table. Attach Blower. This is a 5HP, 3phase radial blower. 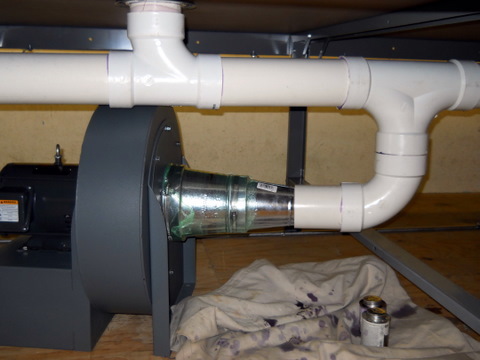 Different blower configurations are available depending on your application. 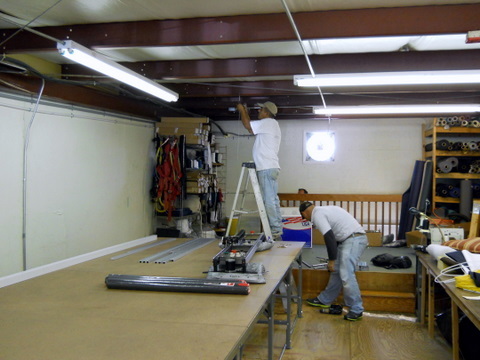 Have your local electrician ready to wire. Place an on off switch on the side of the table with the computer. 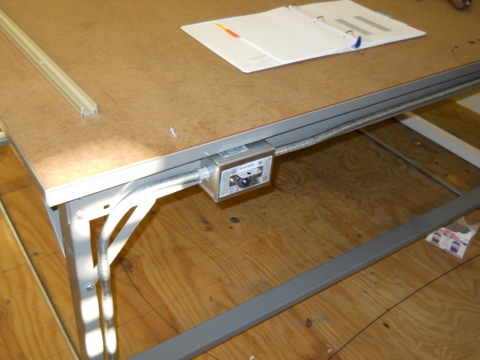 Your control cables can be run from a cable suspended over-head or off one side of the machine. Overhead is simple. Run a wire above head level down the center of the table. Mount your track. Follow instructions closely! You're almost ready to start plotting and cutting. 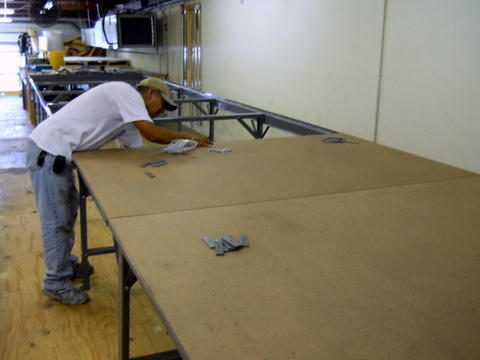 Cover table with cutting surface. There are lots of different kinds, but 1/16" Polyethylene is the most popular. This should last 1-4 years and can usually be found locally. Pat yourself on the back...It was a long day but you did it! 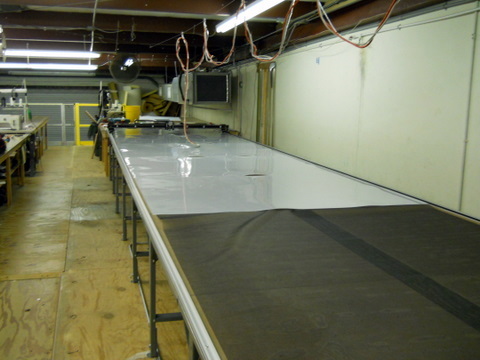 A Carlson Design PT-96" Plotter/Cutter on a 6'x28' phillocraft vacuum table. Time for training! Ed gets the entire team together for group training. 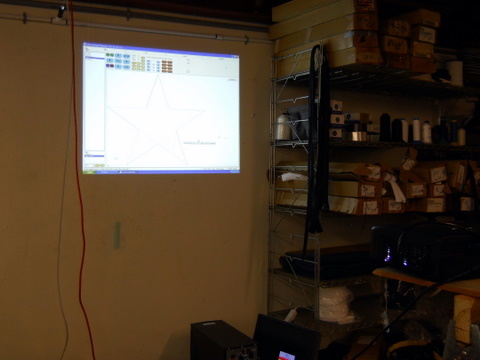 They are still deciding what their operator’s workstation is going to look like, so for training we setup Ed’s projector. A great tool for training large groups! First impressions. Everyone meet the plotter/cutter. Plotter/cutter, meet your new family. Training start with an orientation. Using the plotter/cutter is intuitive, however what to cut isn’t. 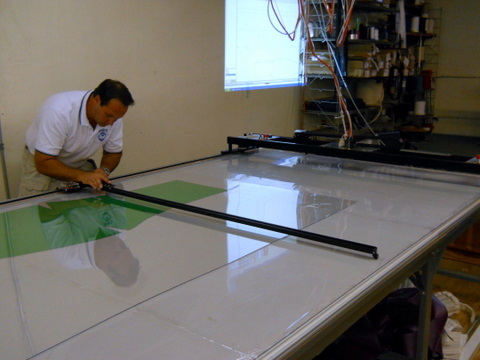 Most first impressions are that the plotter/cutter is only for large jobs or repetitive work. Not so!! 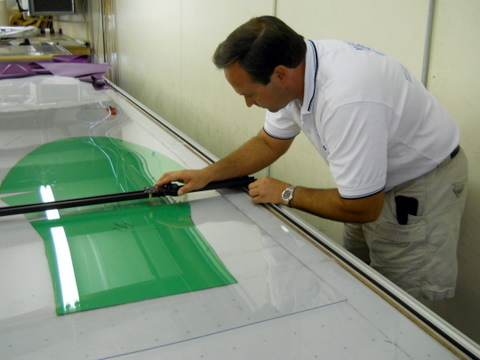 The plotter/cutter makes every plot and cut accurate and repeatable. 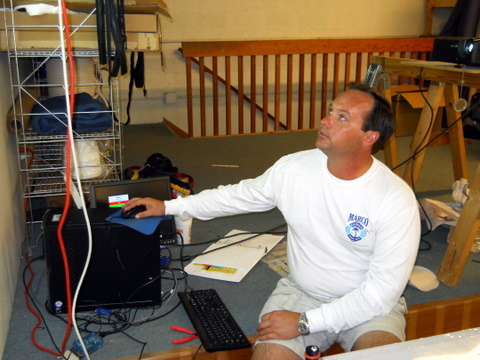 Once a pattern is stored electronically it can easily be recut for recovers or modified to fit a similar job. How do you integrate into everyday operation? Using the Carlson T-Bar Digitizer, you can quickly trace existing hard patterns to make a ready cut file or a file ready to be edited or modified in any CAD program. 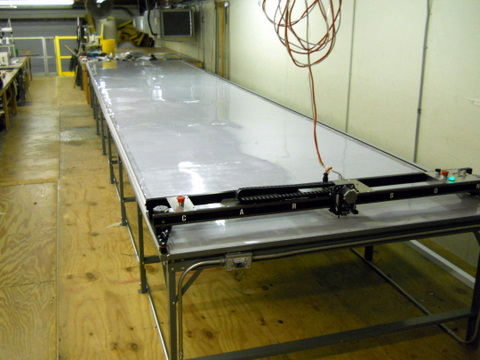 Ed covered his pattern with a sheet of plexi-glass to prevent shifting during digitizing. This Yamaha V6 4Stroke 2010 motor cover is very popular. Once digitized and nested it cut in under 2 minutes. The Marco Canvas team with their newest member! Many thanks to Ed, Tammy, John, Juan, Joz, and the rest of the Marco team for a great week in Marco Island Florida. 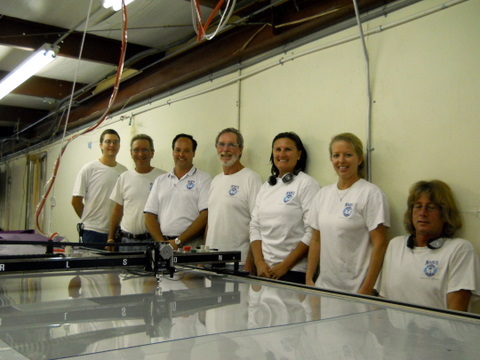 Keep on eye on these guys as leaders in innovation for the marine canvas industry.